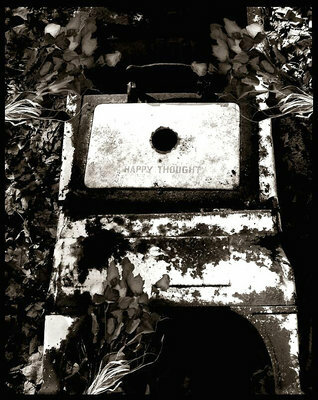 About This is a shot of an old farmhouse stove manufactured about 1928 by the "Happy Thought" stove company. The number is my wimsical estimate of the number of meals cooked over a 30 year period, before it gave up it's ghost. Dried roses thrown on top for added effect? Roses were scanned directly from a scanner. The stove is from a photo taken a few weeks ago. Thanks for the tip on the histogram. I will try it out next time. Great subject and very strong tones Andre! By the way if you use PS CS, you can have the histogram window open while you do your editing and that way you can make sure that nothing gets blown out. The roses perfectly look like they were really there! I do think Thilo is right about me being a little bright on the whites. But other than that, I'm happy with this image. Old cast off items like this seem to cry out with their stories. It might sound sappy to some people, but the nostalgia radiates from them. You can just imagine this stove belonging to a young family in the late twenties. It would have been with them during the depression and WWII. Generations of mothers would have taught their daughters to cook on this. Possibly this was discarded in the early sixties. The same kind of stories hold true for all the old trucks barns and farm equipment that many people post here. All these things have stories to tell in photographs. Excellent work with the composite Andre! I would never have known if you hadn't said.... I love old items that have been discarded and are now languishing in some sort of forgotten corner. Sometimes they're so photogenic and this is a good example of it. It is actually an old stove from the late 20's, early 30's. I felt the same way as you about the burn out on the white area. I was trying to make the roses stand out a little better with the levels adjustment and over-looked the white area. Thinking back now, I should have adjusted the white separately from the rest of the image. It isn't exactly your standard "Hallmark" type Mother's Day image. I thought it lookde so sad sitting there in the old, dead leaves. Thrown aside after approximately 30 years of loyal service. and a weird name as well. anyway, thx for sharing this finding.